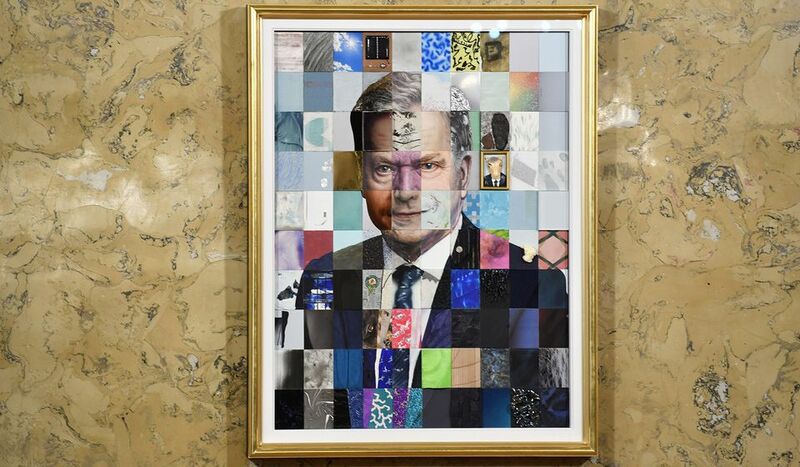 The president of Finland unveiled his new official portrait on Friday, and it's a pixelated image featuring work from a hundred artists. President Sauli Niinistö's official portrait was unveiled on Friday in a ceremony at the Presidential Palace in Helsinki. The work is a mosaic of 7.5 x 10 centimetre blocks, each produced by a different artist. Anita Naukkarinen and Atro Linnavirta served as producers co-ordinating the 100 artists involved in the project, which involved sculptors, painters, and performance and video artists. According to painter Olli Piippo, who produced his own piece of the presidential picture, the artists did not discuss the project with each other before the mosaic was assembled. The painting will hang in the Ateneum Museum in central Helsinki from June.